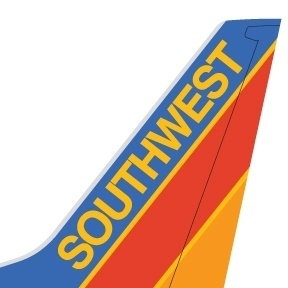 I had a couple of ‘free’ tickets on Southwest that were fixing to expire. These are airline tickets earned with points from other travel. I hated to lose them but I’d let the deadline slip up on me and I didn’t know if I could swing a trip during the block of time I had or not. Besides that, I didn’t have anywhere to go! I thought about it and decided maybe a visit with my sister Judi would be fun. I asked her if she’d be able to get off work if I came over and she said yes. The trip was set. We had no agenda. That meant staying up late and sleeping in. It meant shopping. And it meant eating out at places unknown to me. No pressure. No stress. 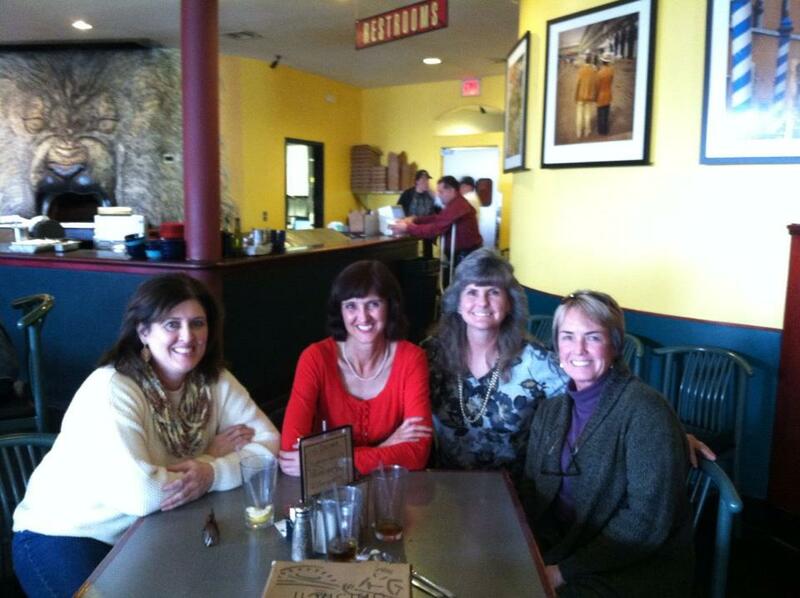 Judi contacted some childhood friends and made a date for us to meet them for lunch. We entered the pizza parlor and there they were, looking pretty much like they always looked! Here we are! Note to self: Don't ever wear white! It makes you look ten pounds heavier! When we were growing up, we lived on a corner of a ‘T’ intersection. Judy and Jana lived across the street. We spent hours together, playing with troll dolls, skating, and climbing the willow in our front yard. Sometimes we played at our house and sometimes we played at theirs. Jana is the same age as my sister Judi, and Judy is a year or so older than me. Judy had beautiful, long, shiny, straight hair. That was the fashion back then. She wore it parted down the middle. My hair, on the other hand, was curly. When I tried wearing it long it looked much like Tiny Tim’s hair looked. It wasn’t attractive. 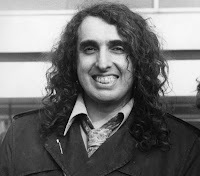 Tiny Tim. I always thought his hair was horrible! And mine looked the same. Of course, I wanted smooth, vertical hair. Judy and I tried many things to make it straight. She helped me iron it, using a real iron on an ironing board. I guess that was pre flat irons! And it didn’t work. We rolled it on orange juice cans. That made bigger waves than I already had. Plus, it was heck to sleep on! We sprayed it with Knox Unflavored Gelatin. That sounds horrible but really it was probably like a spray gel. It made my hair stiff, but alas, it was still curly. We were both in constant search of ‘the’ technique that would make my hair straight! One of the most bizarre things we found was for me to sleep with a nylon stocking on my head. Yes, really. I would squeeze it down over my wet hair. My nose was squashed and my eyes were either open for extended periods or closed. It was difficult to blink. It wasn’t comfortable, and there were all kinds of indents pressed into my face upon awakening. One night, as I was preparing this unique costume before I went to bed, my dad came in. He looked at me, shook his head and backed out of the room! Judy was an expert on the piano. I suppose she took lessons, but I don’t remember for sure. It seemed to me, she could play anything. One song that was especially pretty was “Bridge Over Troubled Water” by Simon and Garfunkel. We had a piano too, but nobody played it. At least not like Judy played. I really wanted to learn that song so she hand copied the entire score. I didn’t realize it then but that was amazing in itself! We visited as we ate our pizza, caught up and reminisced. It was like the old days, minus the troll dolls! My hair is still curly. Judy’s is still straight. Some things never change. It’s good to have longtime friends with whom you can still talk with, laugh with and remember the good (and a few bad) times! Time passed too quickly and it was time to return to work, a necessary evil. I packed, including the extra suitcase I had to borrow, tucked away the memories we made, and went to the airport. I was already thinking about the next time we’d be able to spend time together. I finally got the rest of my packages from the FB game sent off. My sweet friend Debi got the scribble lace scarf/shawl. Scribble Lace. 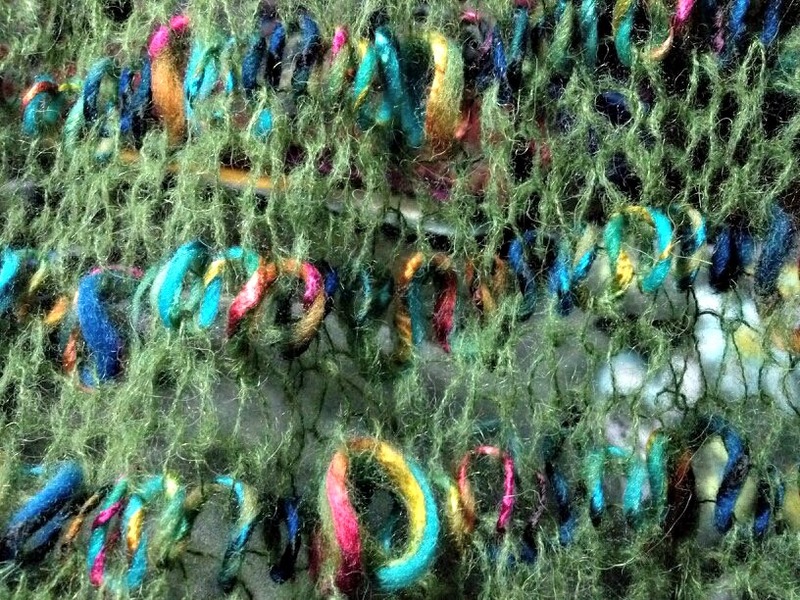 A thick yarn mixed with a thin yarn. 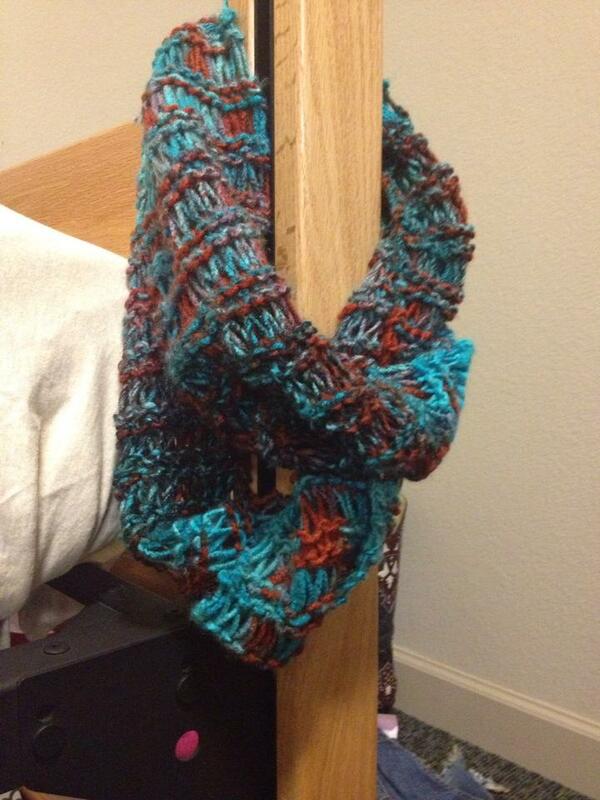 My niece got the drop-stitch eternity scarf. I think they were both pleased! I hope so anyway! A drop stitch eternity/infinity scarf. She said it matched her hair???? I'm glad you had a nice visit. I moved too much as a kid to have long time friends from that time of my life. I'm looking to go away a week with hubby. Just the two of us without an agenda. Not sure when that will be. That would be sweet. It was a nice visit. Interesting, I don't keep up with many friends from the past. My sister is the 'glue'. I hope your week happens sooner than later!! Picturing you with a nylon over your head is cracking me up! Did it work?!? Hilarious! I hope you've grown to love your hair, it is beautiful!